Now that the House has approved rushing an additional $2 billion to prop up the financially strapped “cash for clunkers” car purchase program, owners of the 1991 Dodge Caravan might be thinking of trading in their old boat of a vehicle for something newer. They might be in for a surprise when they get to the dealer. Under the terms of the government’s rebate program, a '91 Dodge Caravan with a 3.0-liter V6 engine and three-speed automatic transmission, rated at 18 mpg, could qualify for a rebate. But the very similar '91 Caravan with optional four-speed transmission, rated at 19 mpg, does not. 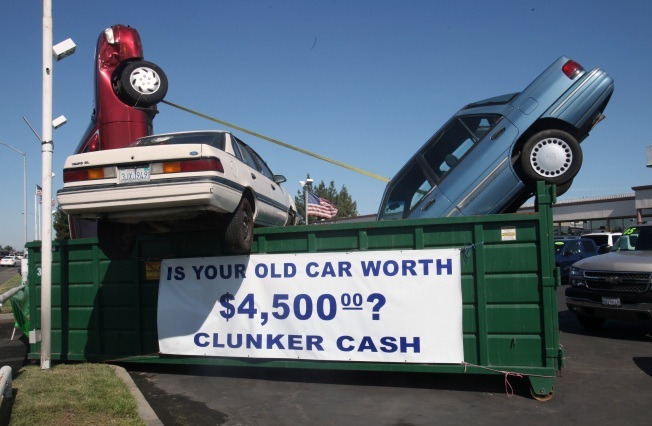 Officially titled the Cash Allowance Rebate System, or “CARS,” the clunkers rebate program was launched just a week ago and lets buyers turn in an old vehicle and receive a voucher for $3,500 to $4,500 toward a new, more fuel-efficient vehicle. Cars and trucks must be 1984 models or newer and rated at 18 mpg or less to be eligible. The program is designed to revive moribund U.S. car sales and get some old, gas-guzzling vehicles off the roads. It has proved so popular that it burned through its entire $1 billion budget in less than a week as new car buyers flocked to dealerships, leaving Congress and the Obama administration scrambling to find more money to keep the program afloat. If the Senate ratifies the House measure and injects more money in the program, drivers may be surprised at what they find when they check on what they consider to be their old clunker. “An awful lot of people out there think that simply moving into a car that gets four miles per gallon better than the one they trade in is going to be easy, but not that many cars qualify because 18 miles per gallon is a fairly low fuel economy,” he said. “You’re looking at a fairly old Ford Explorer with a V8 engine, a Chevy Tahoe or a Trailblazer — vehicles like that, but they need to be fairly old,” said Appel. Take, for example, the Buick Park Avenue, which was in production from 1991 to 1996. The car was big, luxurious and is seen by many as the quintessential American gas guzzler, but in reality the vehicle just misses the clunker program’s with a mileage rating of 19 mpg. It’s the same issue with many old American muscle cars. Often models with V8 engines qualify, while those with four-cylinder engines do not. A case in point is the Ford Mustang. Its 1990-1993 models, in particular, fall into this category, said Appel. “It’s almost as if car shoppers are being punished for the decision they made when they bought their cars,” he said. Typically gas-thirsty pickup trucks are likely to account for a large portion of the vehicles that owners turn in, although even then not all will qualify, Appel said. The 1994 Nissan pickup, for example, may look like a clunker, but only the version with an automatic transmission qualifies; the same truck with a manual transmission does not. It’s a similar story with Ford Ranger pickups, he said. “There are dozens of examples like this in the small pickup segment, where automatic transmissions qualify, but manuals don’t, so the opportunity for confusion is huge,” Appel added.